The boys of fall are back! 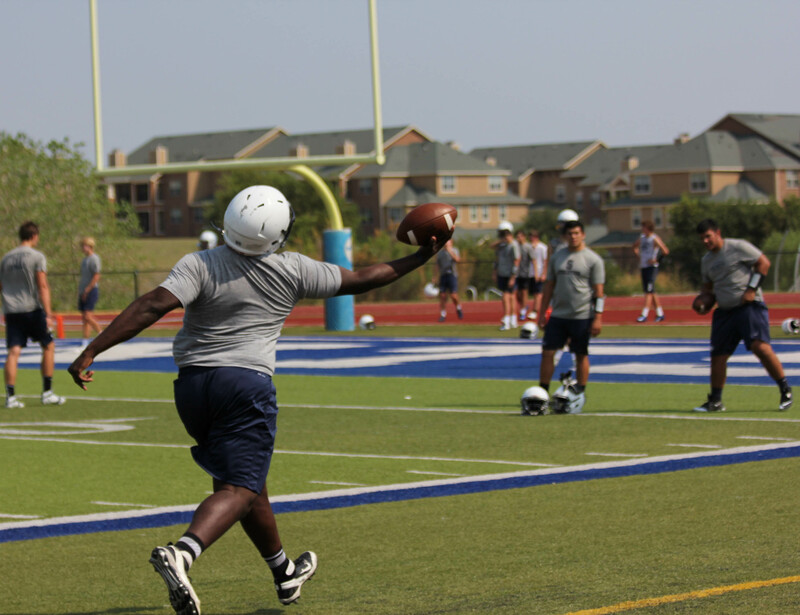 Navy and white spirit is in high demand, the locker room is filled with shoulder pads and wrist bands, and the field is covered in boys becoming men. But, who are these men, and what is their game plan? 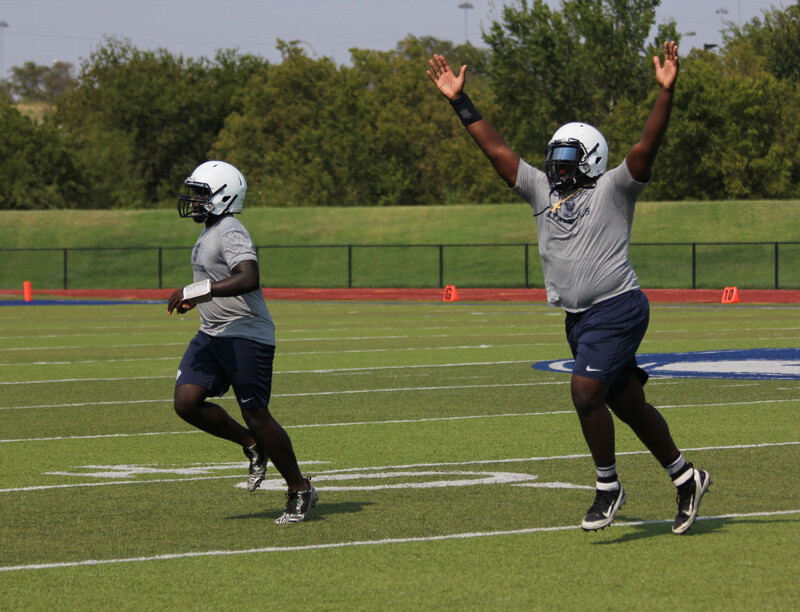 All Saints’ hit the field August 3rd for their first practice of the season. After losing many starters, like Ryan Suitt and Quinton Riney, the boys had a lot of work to do in order to get the team in championship team shape. The upperclassmen, however, are eager and ready to take on the challenge. Some big names to look out for on the field this year includes the two current commits Mike Williams and Isaiah Harris. Mike Williams or “Big Mike” is listed as a 4-star defensive tackle/offensive guard who made the decision to go with the tree and commit to Stanford University July 3rd. Williams pulled off a very unique commitment by choosing to silently commit via his twitter bio. Isaiah Harris on the other hand plays wide receiver for the Saints, and more recently committed to Kansas State on August 18th. Lately, he has been sitting out of practice as a precaution due to an injured hamstring. Harris has said he will be healthy in time for game 1. Some other big seniors to watch are Luke Anthony and Turner Corbett. With Suitt moving on to Columbia, Anthony is QB1 for his senior year. At practice it can be seen from the stands that he is a leader on this team. #3 (Anthony) leads the team from the start of practice warm-ups by calling out the stretches until the final whistle of the day. Currently, Anthony does not have any offers, but that just means he has his sights set on having the best season of his career! Anthony’s right hand man, Turner Corbett, plays running back for Saints. Corbett is a powerhouse, and is currently sitting on two offers, San Diego and Davidson. During preseason Corbett was out with a concussion; however, he is set to be back in the line up for the second game of the season against TCA. The Saints roster is stacked across the board from freshman to the title hungry seniors. It’d be smart to keep an eye out for 6’3” freshman Logan Britt as he sits behind Anthony and Shaun Taylor’18 in the QB line up. Jermaine Rucker and Brendan Harmon are also two names to know as they prepare to do work for the Saints this upcoming season. Sadly, a whole slew of guys were out with injury during the preseason, but senior Noah Moreno said at this point the majority of players are back and healthy just in time for the season. That is great news as the Saints have a tough opener against St. Pius X at the University of Houston. Good luck to the Saints in Houston and PTF!